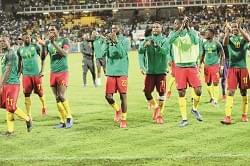 They are to play two friendly matches against the local side on October 13 and 16 respectively. The indomitable lions are in Bamako-Mali where they are expected to play two friendly matches against the local side on October 13th and 16th respectively. Head coach Carl Enow Ngatchu decided to travel with 22 out of the 26 players who were taking part in the 6th training camp at Akono. Among the 22 are two professionals who just joined the squad recently namely; Siakam Vanessa who plays for Tuksfootball Ladies in South Africa and Tantoh Melvis who plays for the Delta Queens of Nigeria. The Lionesses who were received upon arrival by the president of the Mali Women football Commission, took up residence at the Columbus Hotel. They had their first training session on Tuesday evening and made the traditional reconnaissance visit to the venue of the double confrontation yesterday. It would be recalled that both teams which are qualified for the 2016 Women AFCON to take place in Cameroon from November 19, will use the friendly matches as warm for the final phase of the tournament. The encounters will surely be watched closely by the trio appointed to assist the technical bench of the female national selection namely; Etienne Sockeng, Martin Mtoungou Mpile and Jean Marie Amoa since they have as mission to monitor the performances of Cameroon’s opponents at the group stage of the tournament, so as to come up with strategies to counteract them. However it will be difficult to size up the Lionesses since the squad is yet to be completed with the arrival of more professionals still engaged in major European competitions with their respective club sides. The preparation of the Lionesses is close followed up by sports authorities who want to lift the double challenge of hosting and winning the tourney. It is as such that the lionesses benefitted from the visit of the Secretary General of the Ministry of Sports and Physical Education to find out their needs so as to enable them prepare under the best possible conditions for the tournament which Cameroon hopes to host and win.